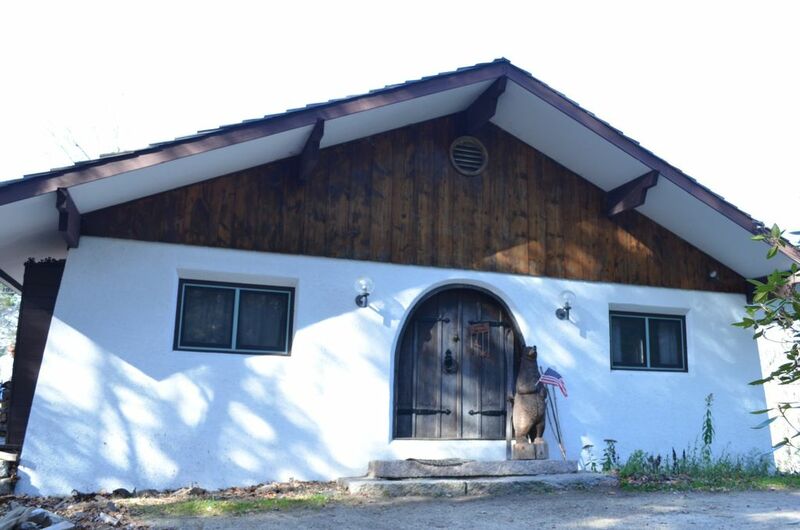 This beautiful 4-bedroom vacation home in Jackson, NH is a gem in any season! With spectacular views of Mount Washington, it is fully equipped, with two full baths, dishwasher, washer/dryer, 2 wood stoves w/ firewood, large dining room, living room, and kitchen, all with a view. Game room with pool table/ping pong. 2TVs with VCR and DVD players (one with cable TV), CD player and MP3 player cable, free broadband internet & wireless access. Spacious wrap around deck with BBQ grill and smoker, outdoor dining and chiminea. BEDS: 1 king, 1 queen, 1 twin room, 1 bunk room with 2 bunk beds. Sleeps 10. Strictly non-smoking. Pets are welcome. 1.4 miles to Jackson Village and public golf course, 3.5 miles to Story Land, 1mile to Black Mtn. ski resort. 15 minutes to Attitash, Cranmore, Wildcat ski resorts. 15 minutes to outlet shopping in North Conway. 15 minutes to Echo Lake and Diana's Baths. Hiking; canoeing, fly fishing and so much more! house has almost all you need. We are a big group of friends who visit yearly. The down side was the cable TV was minimal. We look forward to watching our favorite sports teams after a day on the snow. There is no sports channels available, this was a disappointment, because it was available in all the previous years!! This rental is perfect for our family - it is fully equipped with everything we need and is very comfortable. The open kitchen/dining and sunken living room provide a great space to relax and entertain after skiing, and the view out the enormous windows is amazing. The house is in a great location to access downtown Jackson, but it also feels very private. We will continue to come back! Very pleased with our weekend trip to Jackson! The chalet is full of character and very spacious for a big group! We arrived to a very clean and well stocked home which was great for our party of 9. We got full use of the ping pong table downstairs as well as cozy nights by the fireplace upstairs. Orna is a pleasure to work with and provided very clear instructions to enter and exit the house. It snowed the day we were leaving and a plow came by to clear the top of the driveway. Overall a great experience and pictures don't do this place justice - would definitely recommend! We truly enjoyed our stay here at your home. Everything was there for us. Kids enjoyed the pool table and ping pong table too. I enjoyed the morning sunrise looking out towards My Washington. Everything was available in the kitchen. We also loved being so close to town and surrounding areas. We would definitely come back for another visit. There was so much to do but not enough time to see it All!! Thank you so much for having such a beautiful place to stay.